When it comes to fire prevention and fire protection, constant vigilance is your greatest asset. Here are some commercial fire hazards to avoid this spring. When it comes to fire prevention and fire protection, constant vigilance is your greatest asset. As important as protecting crowded homes or residential buildings against fire are, you’ll want to be sure you extend the same amount of care and attention towards commercial buildings, if not more. Here are some commercial fire hazards to avoid this spring. Electrical devices and wires are critical components of helping your business run smoothly. Whether they are computers, lamps, printers, or anything else that needs electricity, we often take these features of our offices for granted. One fantastic way to avoid commercial fire hazards due to electrical problems is to establish a policy of electrical safety. Every employee should be well-trained in how to handle electrical equipment, especially if they need to use power tools. Any outlets and cords must always be checked to make sure they are in good condition and aren’t coming loose. Do you understand the difference between flammable and inflammable? Both adjectives describe an item that can catch on fire and become commercial fire hazards. Depending on where you work, you should always be wary of combustible substances, especially when these substances are chemicals or other such liquids. Fumes and vapors from the chemicals are more likely to combust, but either way, you should exercise extreme caution. Accidents can and will happen.Those accidents are due to simple human mistakes. One way to fight fires started by commercial fire hazards is to have properly-installed fire sprinkler systems. But the fire sprinkler systems might have been switched off, in which case a dangerous situation can become even worse. Your employees might also be careless and start fires unintentionally; when this happens, you will recognize the value of fire safety training. Fire extinguishers are a vital part of containing commercial fires, but you will need to make sure you have the one you need for the job and that it is functioning before you need it. That’s why regular inspections are so important. 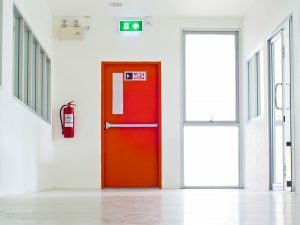 Call the experts at Judd Fire Protection to make sure everything and everyone is as safe as possible. This entry was posted on Friday, March 30th, 2018 at 2:31 pm. Both comments and pings are currently closed.